For a breif second there, we once more got to see the darker side of Houston. That second panel is my favorite in this one, he looks insane. In a good way. Here’s the sketch. 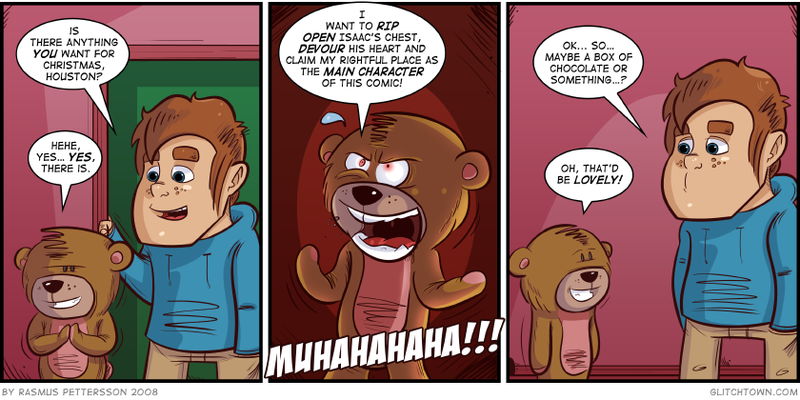 If you compare it with the strip, you’ll see I made a few changes. This entry was posted on Monday, December 22nd, 2008 at 6:00 am and is filed under Comic. You can follow any responses to this entry through the RSS 2.0 feed. Both comments and pings are currently closed. Merry Christmas Rasmus! Love your work! Thanks Pierre, glad you do. I’m starting to like him too. damned! Glitchtown will rule the webcomic world in 2009! I kinda love YOU now, thanks! Merry xmas! Man, this was great. Good show there syst- i mean Rasmus. The artwork progression in your strip is phenomenal!